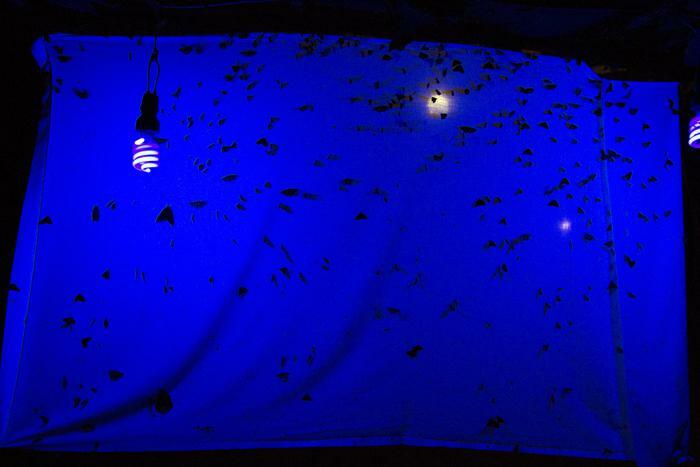 Entomologists Michael Jeffords and Susan Post set up an ultriviolet light next to a white sheet in Fugate Woods at night and attracted a stage show of insects. This pelecinid wasp was one of the highlights of a night walk in Fugate Woods. These wasps are somewhat rare in North America and their presence indicates a vibrant ecosystem.. The large, intricate web this orb spider wove on a bush in Fugate Woods reminded some of the night walkers of E.B. White's famous spider writer, Charlotte. A baby cicada spotted on a trail in Fugate Woods. Entomologist Michael Jeffords said it had likely just emerged from its shell. 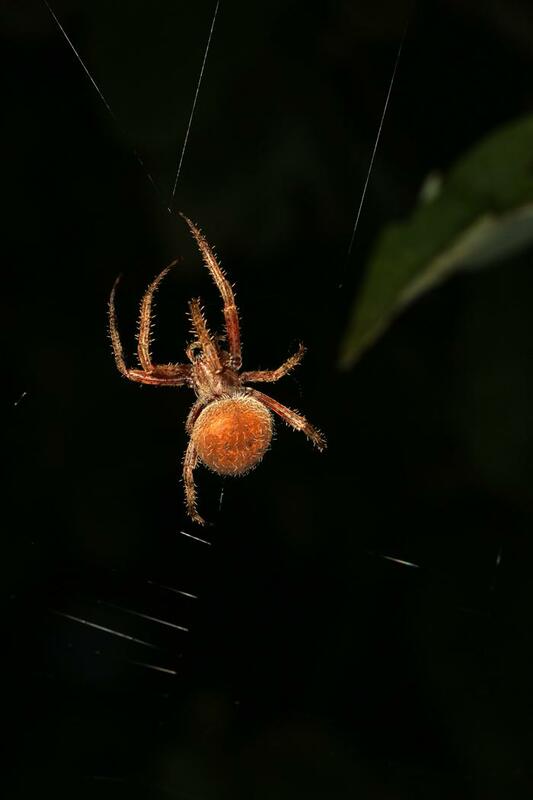 Spiders are among the most visible insects at night in the woods. 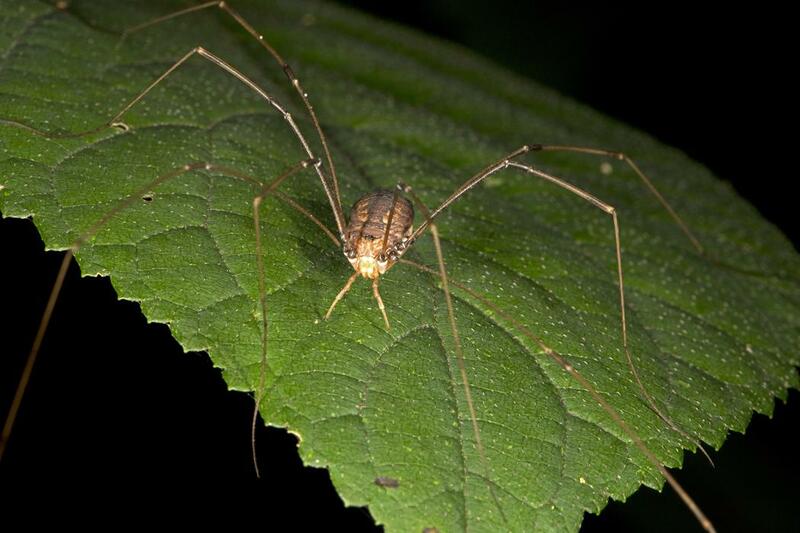 This is the common Daddy longlegs. Armed with flashlights and cell phone cameras, about 80 people participated in a night walk in Fugage Woods. 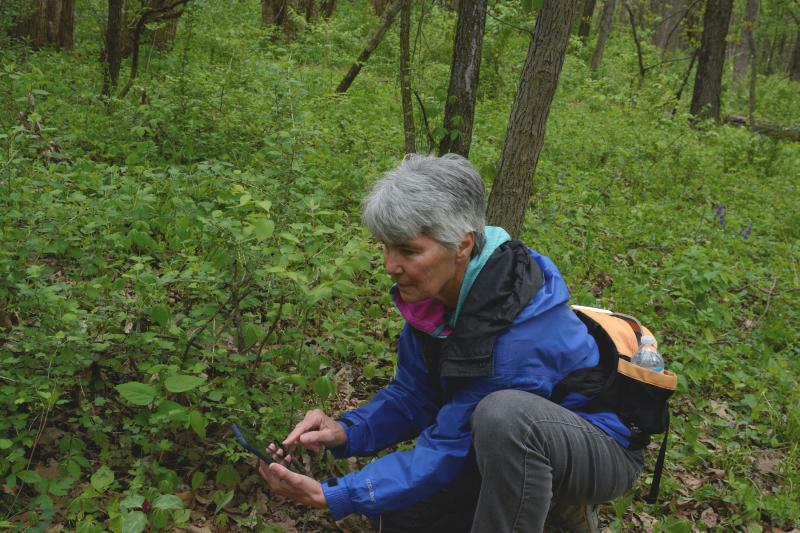 Nonetheless, a group of intrepid nature lovers ventured forth after sundown into Fugate Woods outside of Fairbury with flashlights at the ready to see what they could find. “OK, there’s going to be two groups. One’s going this way with me. That way is the black light, this way we’re just going to be spotlighting,” said entomologist Mike Jeffords, a nature photographer and one of the leaders of the nighttime walk, along with his wife, Susan Post, also a photographer and insect specialist. It turns pitch black after sundown in Fugate Woods, a nature reserve about 35 miles north of Bloomington-Normal in Livingston County. With its 150 acres of timber and restored prairie, Fugate is a little-known jewel among Illinois' natural areas. With our flashlights beaming, our two groups set out to search for night-flying insects, birds and other creatures who relish the dark. Fugate Woods curators had expected perhaps a dozen people to show up for this Saturday night excursion. Eighty came—a mix of students and adults. Jeffords has a couple of theories why. “Either there’s a lot of interest in insects or there’s very little to do in Fairbury on a Saturday night,” he ventured. With Jeffords at the head of the line, our group beams our high-intensity flashlights on the ground and along various trees and plants. Another separate group follows Post, who has set up an ultra-violet light against a white sheet to see what insects might attach themselves to the sheet. “OK, what we’re going to do is walk slowly through the woods, and we’re just going to look for things and see what happens. No guarantees, no lions or tigers or bears, but there might be. We’ll have to see,” Jeffords joked. The first thing we notice is the plethora of spiders. “You see these during the day. This is a phlangid. 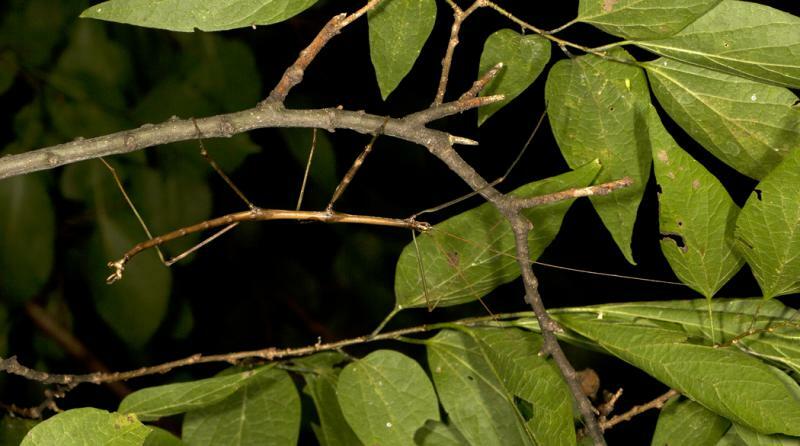 It’s in the same class as a spider,” Jeffords said, training his light on an insect that looks like a daddy long-legs spider. "You can tell they're different from spiders because there are segments in their abdomens, and their defense is to shed legs. The internet says these are the most venomous organisms in the world. Obviously not, not at all,” he said, stroking the bug lightly. Phlangids are, however, predators. Luckily, they are looking for their meals among other insects and not among us. 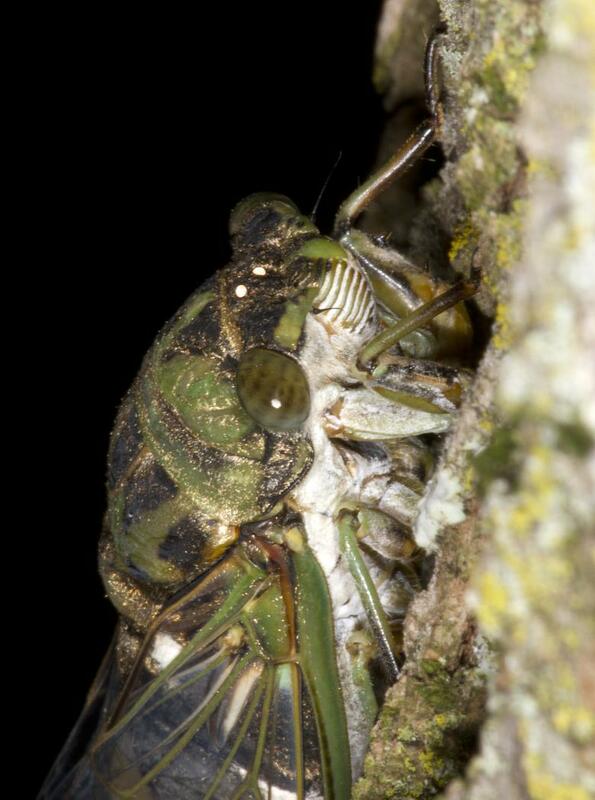 All around us, the forest is abuzz with the thrumming of cicadas, another insect that loves the night. “You can tell the woods are just alive tonight with stuff crawling all over the place,” Jeffords remarked. He bends, picks up from the ground a rather scary-looking dog-day cicada, newly emerged from its shell. “This is a female,” he explained to the captivated students looking at the young cicada in his hand. “If it was a male, it would have a big, what is called a tympanum to make noise to buzz. Females don’t buzz. And the dead giveaway is this is her egg layer. Males don’t lay eggs, obviously,” he said as the young students chuckle. At the next stop, we examine an intricate spider web worthy of E.B. White’s famous spider writer, Charlotte. Jeffords said this web is probably the work of an orb spider. He pointed out that spiders weave their webs from the outside in. "Look at her going around. Look at that beautiful work. What a lot of work," Jeffords told a group of rapt students. The spiders are interesting, but there’s considerable more excitement when Jeffords shines his flashlight on a pair of eyes glaring down on us from a tree branch. “Whoa, look here, come here," Jeffords called out. "Possum! See the eyes." But as a group of boys clamor to get a better look, the creature climbs out of view. “Oh, there she goes. Very cool,” Jeffords said. With Post, Jeffords has traveled extensively in Africa photographing insect, plant and animal life. After spotting the possum, he told the students that it’s a treat to get close to an animal at night. “In Africa, you don’t get out of the vehicle,” he said. “Why is that?” a boy asked. 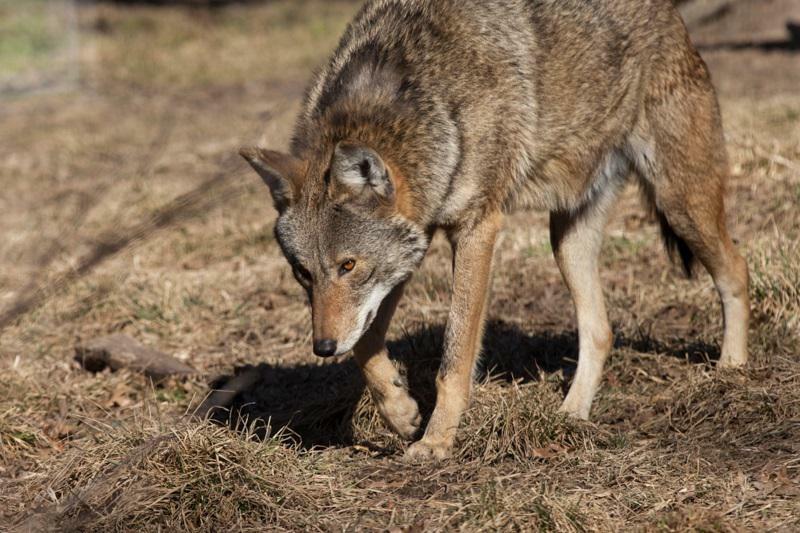 “Because the thing looking back at you might eat you,” Jeffords said. We trundle down a narrow trail to where Post, a frequent co-author with Jeffords, has placed an ultraviolet light and hung a white sheet. The light attracts a menagerie of insects. “You don’t know what you’re going to see. It’s like a big surprise or opening a present,” Post said, surveying the array of insects clinging to the sheet. “So right now, we have sort of like the sparrows of the insect world. We have little brown moths. But look at these flies. We have these flies with great big eyes, some little green leaf hoppers. When everybody drives home tonight, they’re going to go splat and sound like rain against the windshield," Post said. It's Post who spots probably the biggest find of the night. It is resting on a leaf—a really creepy looking insect with a long, skinny abdomen shaped like a question mark. A pelecinid wasp. We agree this particular type of wasp looks more like a spider or a dragon fly. 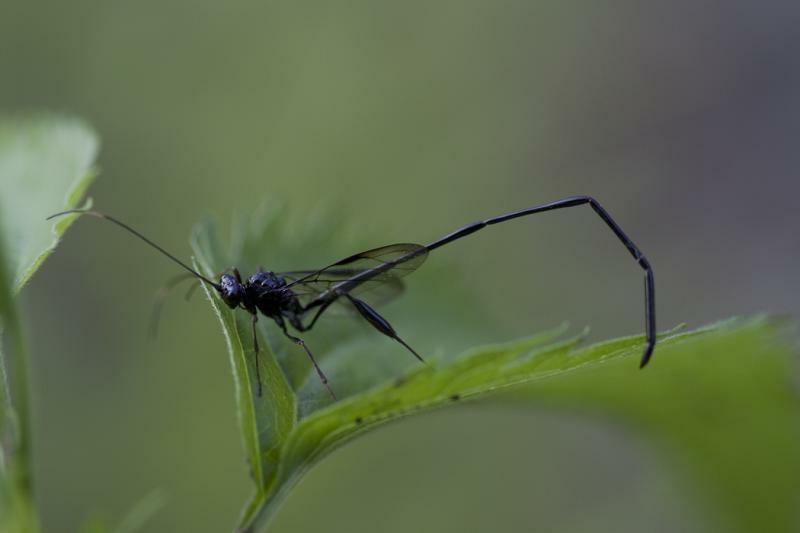 Because pelecinid wasps are fairly rare in these parts, Jeffords says their presence in Fugate Woods is evidence of its robust ecosystem, capable of providing a healthy diet for a variety of insects. Pelecinid wasps love to eat beetle grubs. They use their long abdomens to poke other insects. But don't worry. These wasps don’t have stingers and are harmless to humans. 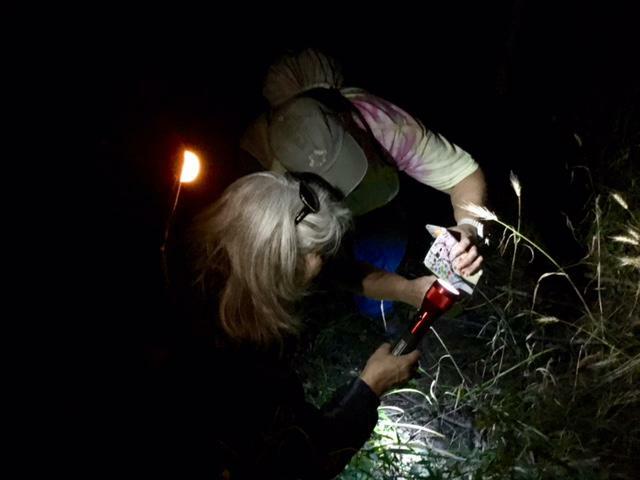 As the group trained their flashlights on the celebrity wasp, Illinois Master Naturalist Mary Ann Stork, a Fugate Woods volunteer, reflected on the evening’s success. The youngsters also didn’t seem afraid of wandering the woods at night. “When you are by yourself, it’s scary, but when you have 80 people around you, it’s fun,” Stork said. Ten-year-old Abby Hoeft of Olympia said she wasn’t the least bit intimidated. “I love bugs,” she said. Heoft says she wants to be an entomologist like Jeffords and Post when she grows up. Fugate Woods’ curators said the nighttime walk proved so popular, they would like to do it again sometime soon. Two years ago, a female eagle was found shot dead in Normal. Her mate soon died -- killed apparently by another bird. Then their three orphaned eagles died. 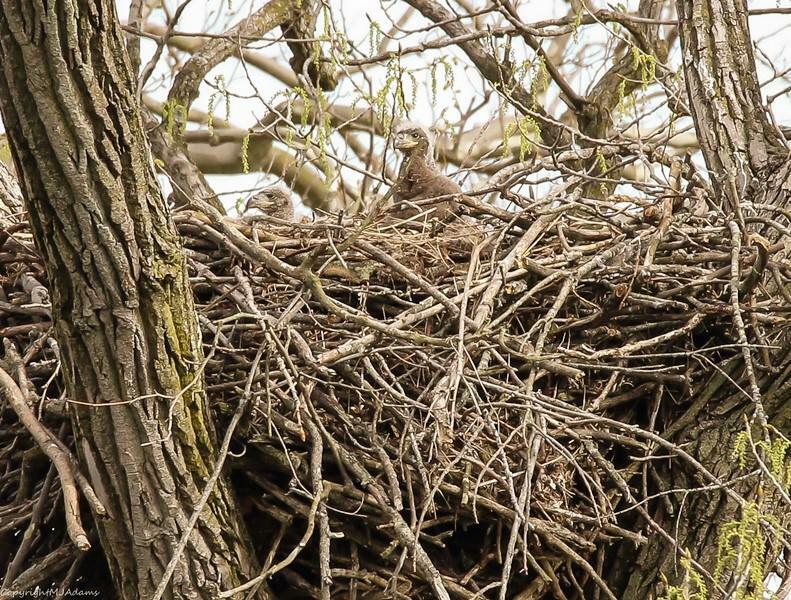 Bird watchers feared it would be the end of eagles in McLean County. But there is good news. 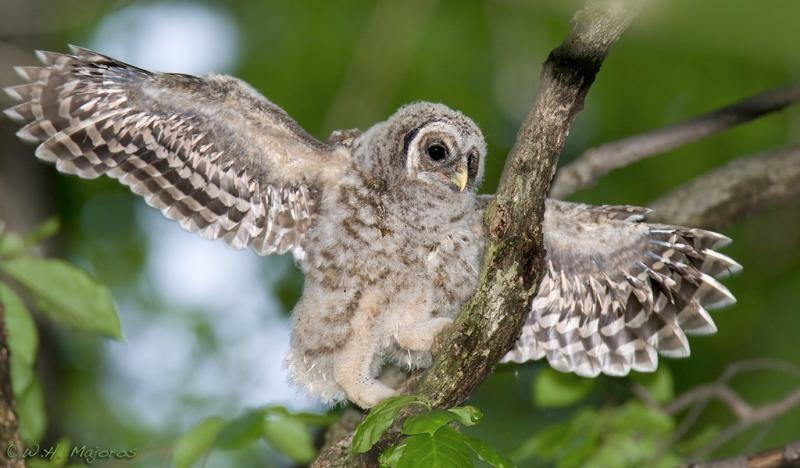 A new pair of the white-topped, hooked-beak creatures has taken up residence in the nest the dead eagles left behind and they are raising three eaglets there.